Peiriannydd wrote: You'd think they'd try to develop images that show the scheme in it's context. That could have been cut and paste from anywhere with the "Capitol" sign slapped on it. I'm not surprised by the intent of having a mix-use development of residential, retail and leisure. Crucially, IT HAS PARKING!!!!!!!! Looking forward to seeing more details of this proposal. Definitely opposite Sainsburys on the corner where the TV screen is. I think the parking will be just what we already have. Note the expansion of the cinema to 8 screens. Also I believe the tower has been renegotiated to around 15 floors now. 15? So essentially half the height? Glad its getting a facelift but thats a little disappointing. I don't know for sure, but I'd guess that any higher and there would be insufficient car parking and access to the car park. 15 floors should still be pretty decent on the skyline if it's on top of the existing floors which are there. How high is the Aspect next door? Are we looking at something around the same height? 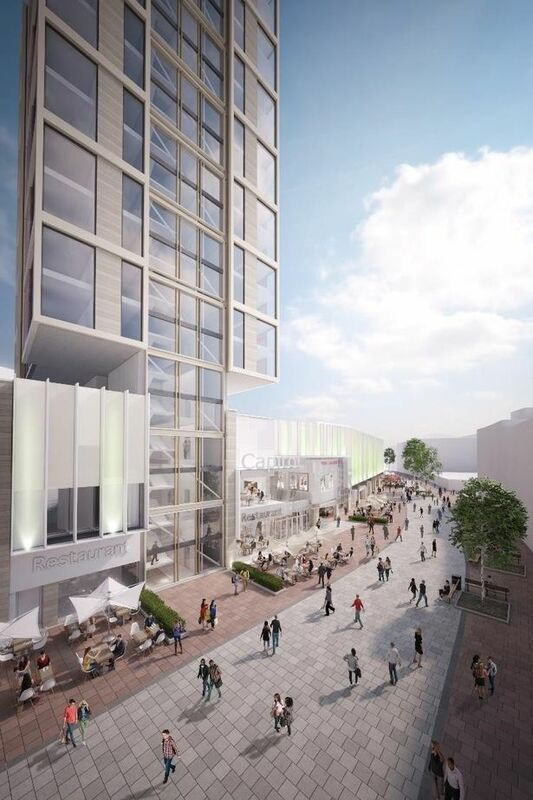 Cardiff wrote: How high is the Aspect next door? Are we looking at something around the same height? Little bit sneaky when they don't show the roof and use a funny distorted projection. I bet my house that this will never look like this if its ever built.